Kotobee Author is an award-winning ebook creator allowing you to create ebooks rich with interactive content, and have them exported to more than 10 different formats. 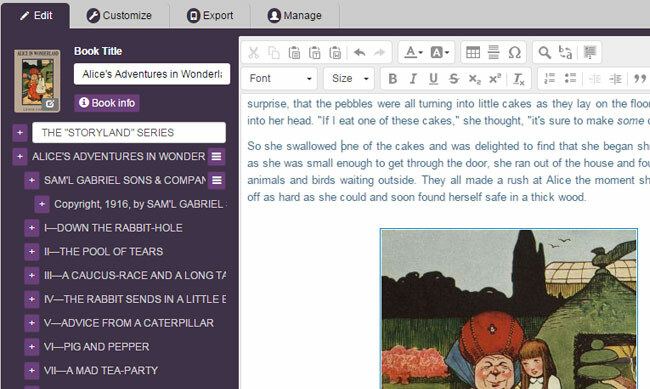 Kotobee Author is a comprehensive ebook creator and EPUB editor, suitable for education, training, and publishing. Kotobee Author is a winner of the Academics’ Choice 2016 Smart Media Award. With Kotobee Author, you may easily create interactive ebooks rich with video, audio, 3D, book widgets, questions, and more. Customize the look and feel of your ebook apps, and emulate the result on different platforms and devices. Export your ebook to many different formats, such as web apps, desktop apps, Chrome apps, and EPUB3, which can be opened using the free Kotobee Reader app (http://www.kotobee.com/products/reader) or using any of the popular ebook readers available in the stores. The Basic License is a $100 value, allowing you to entirely customize and brand your ebook apps with your own logo, removing the Kotobee logo watermark. English, French, Spanish, Portuguese, Dutch, German, Hungarian, Italian, Malay, Polish, Romanian, Russian, Turkish, Arabic, Chinese, Japanese, Korean. There is an extensive knowledge-base (online help manual) available at http://support.kotobee.com. @Ashraf, do you know if these problems have been addressed? I understand that **upgrading** a freebie could result in an end of the free license, but if they said that the license for this version is “lifetime, for commercial or noncommercial use” I expect I can use that specific version forever. Today Ireceived the same email. SharewareOnSale should contact Kotobee to clear this problem. They can’t suddenly demand money for a giveaway! eBooks have been popular for quite a while now. At the beginning, creating ebooks was challenging. With an application like Kotobee Author, the challenge is no more. It is worth noting that many other ebook creators exist, however, I decided to settle on Kotobee and try out what it has to offer. Here is my take on this ebook creator and EPUB editor. Kotobee Author comes across as a user-friendly tool for boosting your e-publishing needs. In no time, you will be through with its installation steps to view its straightforward UI. Immediately, one will note how the application makes it easy to hit the ground running. This ease of use is possible through the application’s wizard-style interface. As noted above, the main interface of Kotobee Author presents a wizard-style approach to creating your e-books. To start with, this approach makes it easy to understand what you are doing. With no prior knowledge on creating ebooks, you will still need minimal time to create your first copy. When it comes to creative work, flexibility is important. Thankfully, you will enjoy flexibility and ability to customize your ebooks while using Kotobee Author. The app provides the “Start From A PDF” and “Mode Selection” option to allow you choose what suits you best. Clearly, the latter option provides more freedom than the former. It allows you to customize your ebook right from its dimensions to content arrangement. In a bid to make it flexible for creators come up with customized ebooks, Kotobee Author packs a collection of other options for the creation process. These options are available from the early creation phase. For instance, you can use the “Components” section to lay the groundwork for your ebook creation. That is, the section allows you to decide how some of the ebook’s features like the Search features, Social Sharing, and Thumbnails will function. Saving your ebook after creation is equally important. This creator gives its users the option to save in different formats like EPUB3, for the web, Chrome apps, and desktop app. Saving the e-book in your choice of format lets you target your users based on the most available ebook reader for them. Clearly, Kotobee Author allows you to create professional ebooks in a fairly short time. Regardless of your experience level, you will find this application easy to use. Its tools and customization options further allows authors create unique ebooks. It is worth downloading and using. What about the Cons? A balanced review usually has both and reviews are especially important with programs like this, that will require a large input of effort. And such issues as the requirement to purchase further stuff to actually get a working ebook would be good to know in advance. Thanks. Hi Neme. I’m the director of Vijua, the company behind Kotobee. I also noticed there were no cons in the review, and I’m sure it’ll be very hard for them to find one. In Kotobee Author, the project file is based on the EPUB standard. What this basically means, is that after investing time developing your ebook with Kotobee Author, and decide for some reason to use a different software, you can easily do that. EPUB can be opened by tonnes of other software. We will not lock you into Kotobee Author (as Apple usually does), and we transparently show you the file structure of your project file via the File Manager in Kotobee Author. Can I just say that your replies here and in the discussion, and the tone of the emails I’ve gotten, are friendly, helpful, and feel honest to me. Although I haven’t tried the software yet, kudos on the great attitude and generous help! If you have been in the position of making an e-book, you know how hard and stressful it can be if you do not have the right tools at hand. This is what the Kotobee Author promises to solve by giving a rich and interactive environment under which you can use a WYSIWYG environment to create professional looking e-books without breaking any sweat. I tried my hand on the PDF maker and this is what I found out. I love the way the Kotobee is a simple install and begin to use app. I really didn’t have any trouble setting up the application and pulling up the e-book customization options. Couple this with the fact that they are all click to apply and that you can see a preview of the product on different simulated devices means that I can always export the e-book with the right formatting. Responsive designs have taken the web by storm thanks to the many devices with varied screen sizes. When launching a new project on Kotobe, you have the option of choosing a responsive design that will scale fluidly no matter the screen size. This is a great tool to have on your side if you are interested in seamless reader experience. Apart from just designing the book, you can also incorporate answers whose answers can be used to calculate a score or sent to an email address. This is a perfect addition to an e-book that will be testing reader comprehension or understanding of the subject matter. Exporting of publishing presented me with a wide range of options, from the basic EPUB and Kindle options to web apps, desktop apps, web apps and even native mobile apps. This dynamicity makes Kotobe an excellent one point design multiple publisher that will drive interactive e-books to a wide range of platforms. Interactive publishing was only well supported when creating web apps, hosting online or rendering to a native mobile or desktop app. PDF, Word and EPUB will lose some of the seamless interactivity like filling forms or answering questions and emailing responses to a collecting email. I also had to download plugins before doing an export. I know this makes the app lightweight by letting someone choose what they would like to have installed on their PC but it would do no harm to just give me an app with the basic export plugins in place. Kotobe is sleek, neat and surprisingly easy to use. It might be a bit slow when encoding elaborate e-books (that is expected) but it always gets the job done. Word of advice, don’t bother putting the questions and response forms when publishing to PDF, Word, EPUB or Kindle as the fields would be inactive. It would have been clever if the developer disabled these options on such exports since they are useless unless you are going to create a hard copy of the e-book. Thank you Melvin for the positive review and feedback. Very well written. I would just like to make a simple correction, which is that exporting to EPUB format will still keep all your interactivity in place. The EPUB3 does support interactivity (multimedia and scripting) but not the other standard types like PDF, Word, or Kindle. Kindle’s specification accepts video only at most, but no scripting. There’s also a great feature which is the possibility of adding book widgets inside your ebook, that can run on all platforms. Simply go to bookry.com or bookwidgets.com, grab any widget you like there, customize it, and add the file in Kotobee Author with the widget tool. Our users have been fascinated by this. The easiest and quickest way to make your readers go WOW! It is a very fine software in every way! It’s fun to work with!